Raising a young scallywag on the high seas isn't quite as easy as it used to be. The amount of buried treasure has dwindled in the last few centuries, making it hard for pirates to scrape together the gold doubloons needed gear their little ones for high adventure. How's your little one supposed to join you on all that swashbuckling adventure without a cool pirate outfit to wear? That's why it's important for buccaneer parents to keep their eyes open for a good deal when they see one! 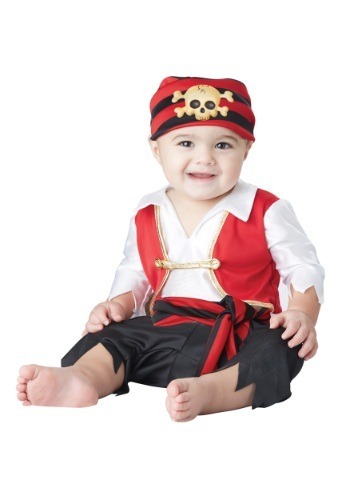 This Pee Wee Pirate Costume is an adorable infant outfit that will turn your baby into the most fearless and most adorable scallywag to sail the seven seas! The costume combines white pirate-style shirt with a bright red vest to create a classic look perfect for your little first mate in training. Combine that with the skull and crossbones hat and your infant will be ready to join you in your quest to find some buried treasure.